The Minivator 2000 curved track system is tailored to your individual staircase, ensuring the best fit possible. 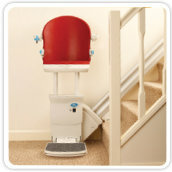 Optional powered features to fold the footplate and to swivel the seat at the top of the staircase to allow for ease of exit are available. The twin rail system, designed for a stable and smooth ride, is supplied in light grey or gun metal as standard; Minivator also offer special orders so the track can be finished in any colour to suit your décor. The track can be designed to take you from the ground floor directly onto the landing level, to suit your needs exactly. The Minivator 2000 can be combined with powered automatic hinge solution to prevent the track from obscuring any doorway at the base of the stairs. If you have restricted movement in the knee or hip joints you may find sitting painful. In these situations a perch seat may be the solution. 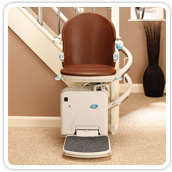 A Perch seat means that the user is almost in a standing position when they are using the lift. There is a shortened seat and retractable seat belt which provide a stable support area for users to perch on. Perch seats are available on the Simplicity+, 1000 and 2000 lifts. Upholstery is available in a choice of six colours. If you need help or advise to find out which seat is most suited to your needs, please contact us.